To most people, the word sugar refers to the white crystalline substance that you use to sweeten your tea and coffee. But when your chemistry teacher says 'sugar', he most likely is referring to one of a wide range of molecules ranging from glucose, sucrose, fructose, or any other molecule that ends with -ose. In facts, 'sugar' is a loose term used to refer to a wide range of substances within a class of compounds known as carbohydrates. Carbohydrates can be conveniently divided into two classes: simple sugars and complex sugars. This article will focus on hexose sugars—sugars with six carbon atoms per monomer molecule. Simple sugars are either monosaccharides (mono- means 'one') or disaccharides (di- means 'two'). Disaccharides consist of two monosaccharide molecules linked together by a chemical bond called a glycosidic bond (the bond that links monomers in carbohydrates). Monosaccharides are the basic building blocks of carbohydrates. Simple sugars are quick sources of energy for mammals. They are absorbed much faster into the bloodstream than complex sugars, because they are much simpler in structure. Simple sugars occur naturally in foods such as fruits, vegetables, and milk products. Processed or refined foods like candies, cake, soft drinks, soda, syrup, jellies contain high amounts of simple sugars. 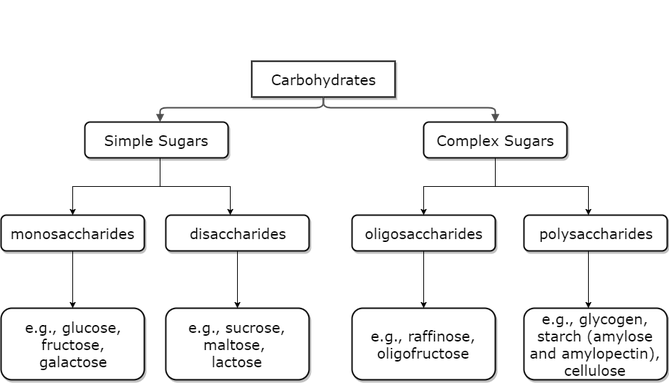 Further details on sugar formulas and chemical structures, starting with the well known simple sugars: sucrose, maltose and lactose. The chemical formula for sucrose is C12H22O11. 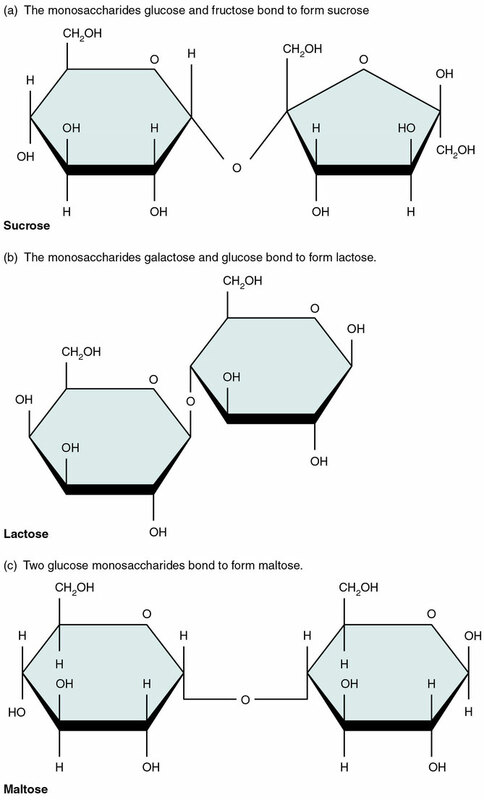 Sucrose is a disaccharide made up of a glucose and a fructose molecule—details on glucose and fructose are shown below. Sucrose has 12 carbon atom, 22 hydrogen and 11 oxygen atoms. Sucrose is what is commonly referred to as 'table sugar'. It is the granulated sugar we all use to sweeten our food with. Sucrose occurs naturally as the main sugar is fruits such as pineapple. When experts tell you to stay away from foods with high sugar contents, that includes sucrose-rich foods such as ice cream, lollipop, lemonade, cookies, pudding, etc. The chemical formula for maltose is also C12H22O11. Maltose is a disaccharide consisting of two glucose molecules. It has the same chemical formula as sucrose. This means that maltose also has 12 carbon atoms, 22 hydrogen and 11 oxygen atoms. However, they all have different chemical structures as described in the figure below. Maltose-rich foods include potatoes, bread, cereal, pizza, honey, etc. Malt, a product used to brew beer, is packed with maltose. In fact, the name 'maltose' was derived from the word 'malt'. When we eat, starch is broken down into maltose molecules, by a digestive enzyme called amylase. Maltose is further broken down into glucose molecules by a special digestive enzyme called maltase. Just like sucrose and maltose, the Chemical formula for lactose is C12H22O11Sucrose, Maltose and lactose are all disaccharides that share the same chemical formula. They have the same number of carbon, hydrogen and oxygen molecules (12, 22 and 11, respectively). As already mentioned above, all three sugars have different chemical structures (presented in the diagram below). Lactose is made up of one molecule of galactose and one molecule of glucose. It is a sugar mainly found in milk and milk products, including butter, cheese, yoghurt, pudding and ice cream. Lactose is an important energy source for babies; breast milk and most baby formulas are both rich in lactose. The Chemical formula for glucose is C6H12O6. Glucose is a monosaccharide with 6 carbon atom, 12 hydrogen and 6 oxygen atoms. It is the key source of energy for cells in our body. The animals, the digestive system breaks down carbohydrates and releases glucose into the bloodstream of animals. Foods like candies, fruit juice and cake are filled with simple sugars (e.g. sucrose) that can be processed through digestion to released lots of glucose molecules into the bloodstream. On the other hand, plants have a more impressive way of obtaining glucose. They make glucose from scratch in the presence of sunlight using carbon dioxide and water; in a process called photosynthesis. The chemical formula for galactose is also C6H12O6. 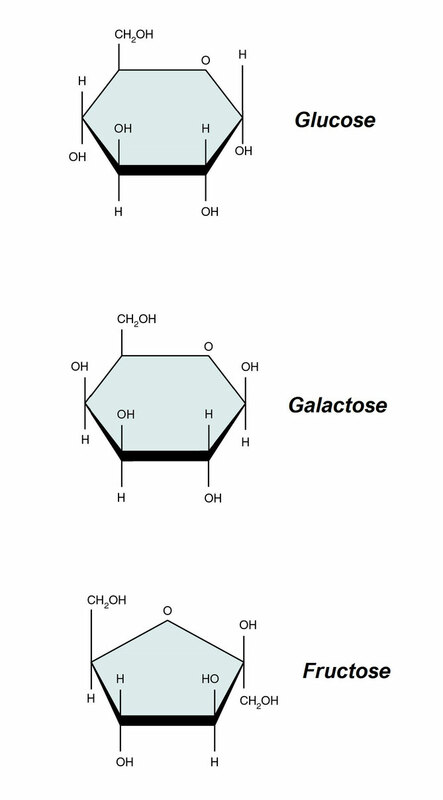 Galactose is a monosaccharide with the same chemical formula as glucose and fructose. Hence, it has the same number of carbon, hydrogen and oxygen atoms as a glucose and fructose molecule (6, 12 and 6, respectively). Unlike sucrose and glucose, it is not found in high quantities in many of our foods. It combines with glucose to form lactose. 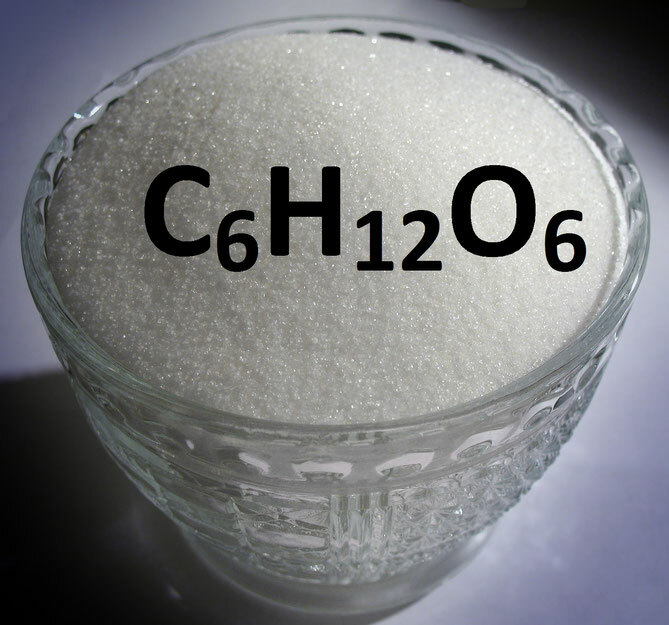 Just like glucose and galactose, the chemical formula for fructose is C6H12O6. Fructose is a monosaccharide with the same chemical formula as glucose and galactose. It also has 6 carbon, 12 hydrogen and 6 oxygen atoms. It is typically found in fruits where it is sometimes bonded to glucose—as sucrose. Fructose is commonly added to foods as a cheap alternative to other simple sugars. As the name suggests, these are more complex in structure than the simple sugars. They are long chains of monosaccharide molecules linked together like a necklace. They can divided into two classes: oligosaccharides and polysaccharides. Polysaccharides are more complex than oligosaccharides; oligo- means 'few' while poly means 'many'. Hence, oligosaccharides consist of three to ten units of monomer while polysaccharides are consist of a lot more. The following sections will be limited to polysaccharides. Living things mainly use complex sugars either for energy storage or structural support and protection. Complex carbohydrates can be found in whole plant foods such as bread, rice, pasta and potatoes. After eating a piece of bread or anything else that contains starch, digestive juices in the mouth and stomach break down complex sugars into simple sugars. Simple sugars are then released into the blood and transported to cells where they are used as energy to run bodily functions. Excess simple sugars are converted into a storage form called glycogen and stored as an energy reserve. Some of the most common complex sugars are discussed below, including their sugar formulas. Glycogen is used by animal as a store for energy. It is a long chain of glucose molecules linked together by a glycosidic bond (an alpha-1,4-glycosidic bond), with branching at about every 10 molecules via a glycosidic bond (an alpha-1,6-glycosidic bond). A glycogen polymer contains about 30000 glucose units. When the body needs to tap into its reserves, glycogen molecules are broken down to release lots of the individual glucose constituents to be used for energy production. Due to the alpha-1,4-glycosidic bond, glycogen and starch have a helical structure convenient for energy storage. Just as glycogen is the energy store in animals, starch is the energy store in plant. Unlike glycogen which comes in a single form, there are two different forms of starch: amylose and amylopectin. It is believed that 80% of starch is made up of amylopectin and the remaining 20% is amylose. Amylose is an unbranched polysaccharide of glucose molecules. Hence the only difference between glycogen and amylose is the lack of branching in amylose. Amylopectin: Just like glycogen, amylopectin is a branched polysaccharide of glucose. The only difference between glycogen and amylopectin is its less frequent branching. In amylopectin, the branching occurs at about every 30 molecules of glucose. Amylopectin is made up of thousands to hundreds of thousands of glucose monomers. When we eat starchy food, the salivary gland and the pancreas release enzymes called alpha-amylases (salivary and pancreatic amylases respectively) into the month and the stomach respectively. These enzymes split the glycosidic bonds to break down starch into maltose molecules. Another enzyme called maltase produced by the small bowel further breaks down maltose into individual glucose molecules. Cellulose is one of the most common type of organic compounds on earth. It is an important structural component in plant cells. Unlike the above polysaccharides, cellulose is made up of individual glucose molecules connected by beta-1,4-glycosidic bonds. This bond gives cellulose its linear structure. 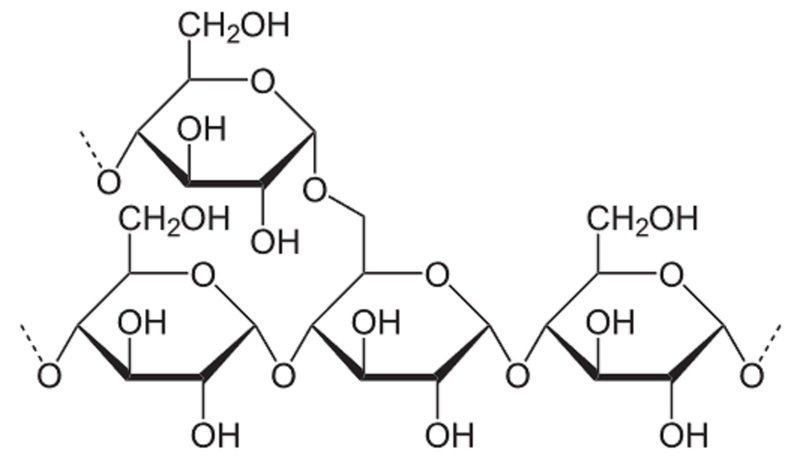 Because of the linear structure, several chains of cellulose can be stacked on top of each other. The chains interact with each other via hydrogen bonds which gives cellulose its high tensile strength. Cellulose provides structural reinforcement in the cell wall of plant cells. Unlike goats and cows, humans cannot digest cellulose. This is probably why we call it roughage or fiber. It has no known nutritional benefit, however, it is known to improve our bowel movement, hence promoting a clean and healthy bowel.